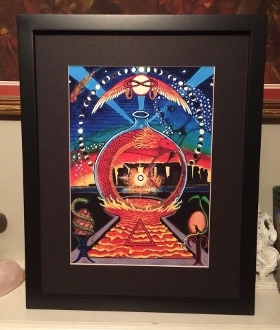 11x14 matted art-either deck-ships anywhere! Decks and Books >> 11x14 matted art-either deck-ships anywhere! 11x14 Tabula Mundi or Rosetta signed print on matte photo paper printed with archival inks, matted in raven black mat board, backed with acid free foam core and ready to ready to frame in any standard frame. FRAME NOT INCLUDED. Ships flat, separately from other items ordered. Email for cost savings on shipping multiple prints - the cart does not understand they can ship together.